An art exhibition of works from diverse artists exploring the common dignity that binds us together as we seek to come together in the midst of a world marred by division, suffering, and darkness. We invite you to visit our Abbey on November 17th for an “open house”-style Opening event, December 20th for the Closing event, and throughout the exhibition! A bridge in itself, the Abbey seeks to bring together people, perspectives, and beliefs through the arts, encounter, and prayer. This is Art at the Abbey’s third annual art exhibition. 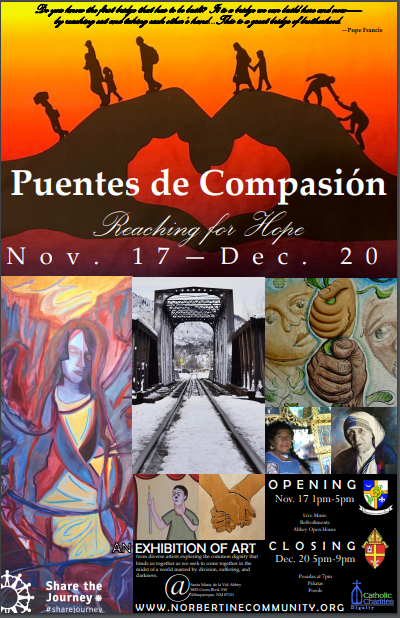 This art exhibition will be open during the business hours of the Norbertine Library and is subject to office closures through Thursday, December 20. Check our website and Facebook page for details about the official closing event to include food trucks and Posadas on December 20, 5:00-9:00 PM! Archdiocese of Santa Fe, Catholic Charities, and the Norbertine Community of Santa Maria de la Vid Abbey towards the “Share the Journey” Campaign launched by Pope Francis.